This luxurious hotel is set at the heart of Bangkok's major business, leisure and entertainment districts. 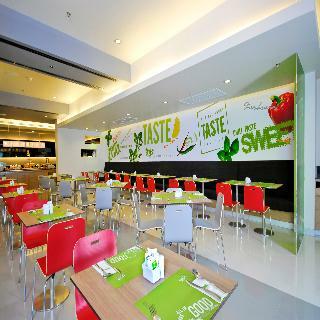 The hotel is located close to The Emporium leisure complex and the lush Benjasiri Park. Guests can enjoy close proximity to the Phrom Pong BTS Sky train Station, the Expressway and Suvarnabhumi airport. This up-market hotel is sure to impress, extending a warm welcome to guests upon arrival. The hotel delivers the utmost in comfort and convenience, as well as unrivalled luxury and style. The guest rooms enjoy an ambience of peace and serenity, in which to escape the rest of the world. Guests can keep fit in the 24-hour fitness centre, or enjoy a refreshing swim in the rooftop infinity pool. This upscale hotel appeals to discerning business and leisure travellers alike. The hotel is a fantastic hotel conveniently situated in the heart of Bangkok's business district and within a stone's throw from shopping, and entertainment venues, right in the middle of Asoke and Sukhumvit districts. Guests will enjoy convenient access to public transport, including, the MRT subway and the BTS Sky Train. A number of easily accessible on foot sites include Benjakitti Park and Queen Sirikit National Convention Centre. The hotel boasts tastefully appointed rooms featuring modern décor in calming neutrals with bold splashes of colour, all rooms include39-inch LCD TVs with multimedia hubs Coffee/tea facilities DVD player and Free Wi-Fi. 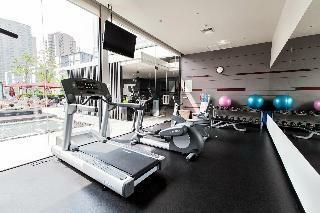 The hotel provides a well-equipped fitness centre and a bar serving cocktails and snacks and has creative and chic dining options. With accommodations that are both comfortable and affordable, the hotel is a great choice for business or pleasure. Known for exceptional service and prime location the hotel offers award-winning accommodations. With its prime location and impeccable service, it is no wonder this hotel is the ideal place to stay when visiting Bangkok. Ancient fantasy meets high design and it's everything you could ask for. A party venue for living it up between dusk and dawn. A meeting spot for making an impression on an important business contact. A vacation hotspot steps away from the epicenter of Sukumvit, the city's pulse for fashion, business, entertainment, nightlife, international hospitals and shopping. And there's more. During your visit, our intuitive staff will tend to anything and everything necessary to take your stay from ordinary to "No way! I must be dreaming!" More chic, stylish and modern than other nearby stopovers, our rooms and on-site amenities are also unequaled. Order up a cocktail and chill out at the year-round rooftop pool. Rejuvenate at The Seven Rituals Sanctuary and Spa with signature services to make you forget every care. Sample at least one - but we recommend trying all three - of our unique Flavas: Flava Restaurant - a Dali-esque hotspot for Thai-Western Cuisine; Flava Bar & Lounge - a candy-striped fantasyland infused with a dash of Southeast Asia; or Flava Lite - your go-to for a little pick-me-up in-between adventures. The establishment features spacious accommodation with views of its landscaped gardens and free-form pools with water features. Kempinski is attached to Siam Paragon, which offers shopping, dining and entertainment options. The 303 opulent guest rooms and suites offer the finest furnishings and state-of-the-art technology. All room amenities include a private balcony, work desk, LED flat screen TV, wireless broadband, media entertainment centre, iPod connectivity, complimentary minibar items, tea & coffee making facilities and spacious en-suite bathroom with separate shower and bathtub. The property also boasts 6 dining options and free Wi-Fi.A choice of 4 food and beverage outlets includes Brassiere Europe for traditional European cuisine and Sra Bua for contemporary Thai dishes. Professionally trained tea masters serves guests at the T Lounge, and for pre-dinner drinks enjoy the 1897 Bar. The hotels wellness facilities include multiple swimming pools located within the landscaped gardens, the Spa with a range of restorative treatments and a fully equipped fitness centre. Additional hotel services include 24-hour room service, babysitting service, concierge, children's play area and business centre. This aparthotel is located on a quiet street just off of Sukhumvit Road, providing easy access to business meetings and city sights as well as peace and quiet away from the hustle and bustle of one of the city's main commercial areas. The Phloen Chit and Nana BTS stations are within walking distance, and Bumrungrad International Hospital is ten minutes' walk from the hotel. Guests might also take advantage of the hotel's free shuttle bus service to Central Chidlom and Central Embassy. Each modern apartment comes with complimentary internet access, a fully-equipped kitchen, and contemporary facilities such as a washer/dryer. The hotel also boasts a rooftop swimming pool and children's pool, a tropical garden with barbeque facilities, and a fitness centre with yoga and meditation rooms, all for a fantastic city break or productive business trip to Bangkok. This elegant hotel was created by travellers for travellers, as a place for sipping, munching, chatting, laughing, playing, cuddling and dreaming. It is a place to engage, as well as for guests to rest their weary head at the end of the day. It is situated on the vibrant Sukhumvit road, with plenty of retail spaces, bars and food stalls, and within walking distance from Ploenchit and Nana BTS stations. Guests will appreciate the accommodation units featuring creative design touches as well as plush and extra plush rooms for guests’ convenience. This relaxing retreat in the middle of the city offers a wide choice of facilities that include a stunning rooftop pool, a fitness centre ideal to maintain the daily exercise routine and an elegant restaurant. 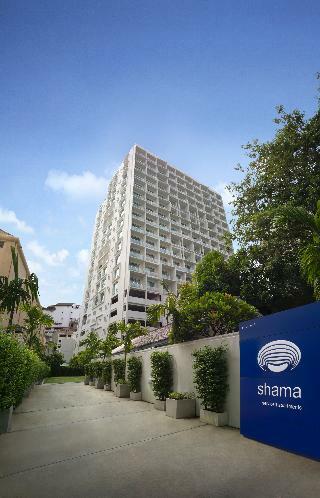 Located in the heart of Bangkok this hotel is close to major embassies, commercial centres and Lumphini Park. It is within walking distance of the BTS mass transit system, and Bangkok Thailand International Airport is just a 30-minute drive away. This contemporary establishment fuses elegance and technology, artistry and expertise. It has 391 guest rooms and suites and provides guests with the cutting edge in design, cuisine and service. The residence features a SPA with 11 private treatment rooms. In-room and poolside massage treatments are available and more active guests can keep up their routine in the on-site fitness centre, including a fully equipped gym with sauna, aerobics room and a rooftop jogging track. 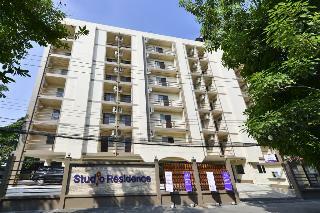 This boutique hotel is located in the very centre of Bangkok city, on Sukhumvit Road. 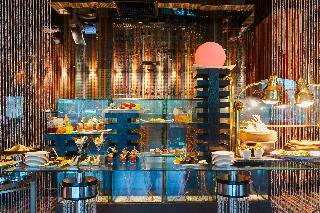 Bars and restaurants are within walking distance, as well as the Central World and Emporium shopping centres. Public transport is also easily accessible from the hotel, with the Sukhum metro station about 1.5 km away and Ekamai Bus Station approximately 4.8 km away. The hotel's friendly staff and a colourful atmosphere will ensure that guests make the most of their Bangkok experience.